Sending sake out to the world as part of the Japanese national identity. "Akashi-tai," known even in Europe, a challenger store with an abundance of ideas. Your representative brand, "Akashi-tai," has received good reviews overseas, hasn't it? President Yomezawa, is a man rich with ideas. 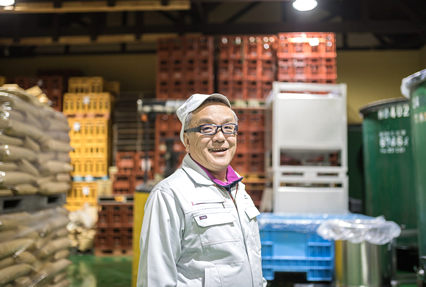 I began making sake to continue the family business about 20 years ago. Up until then I was an office worker. At that time there was still a little lingering feel of the bubble era. The amount of clear sake being consumed in Japan was gradually going down. In the midst of that, "Akashi-tai," which was a local sake that was very particular about the ingredients and how it was made was never a major brand within Japan. So I thought "if it makes a name for itself as a brand competing overseas, will the reviews in Japan change too?" and that was the motivation. So I started by entering it into an overseas contest. As a result, for two continuous years "Akashi-tai pure rice, very special brew" received the highest award in Europe's iTQi international food contest. It also received the Monde Selection gold quality award for two years. At the same time as that, I did PR for "Akashi-tai" by submitting it to many food and drink industry exhibitions, centered on the undeveloped parts of Europe and Asia. Currently, with England as the center it has come to be exported to about ten countries. I think the review of Japanese sake in Europe is extremely high. There are a lot of people who have a wealth of knowledge on wine, and they regard tastes which they think are "delicious" as very important. 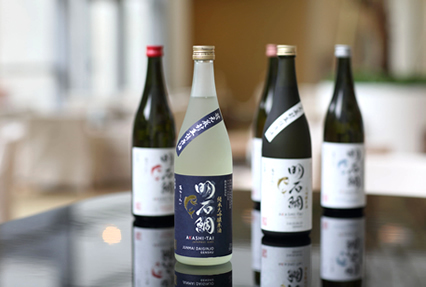 "Akashi-tai" is a Japanese sake which is particular about the ingredients and is made with respect. It's also easy to pair along with cooking. Therefore I think that is especially why "Akashi-tai" was received with the same sensation as wine. Now it is available on the round the world cruise liner "Queen Elizabeth" as well. What kind of sake is "Akashi-tai?" The factory right along the national highway number 2's on site shop. They also enthusiastically collaborate with local events. The Akashi sea bream is so delicious it's sometimes called the "king of fish." In order not to lose to that "king of fish," I thought to give it a name that would enable it to become the "king of sake." 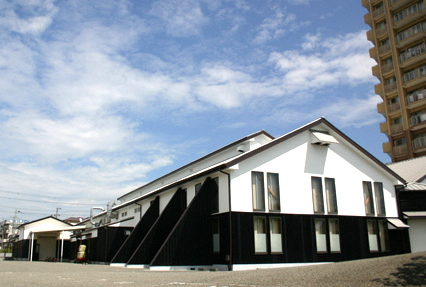 My company was established in 1860, and began making clear sake after the war, in 1955. "Akashi-tai" has continued to be made since that time and is a trusted, high-selling product. 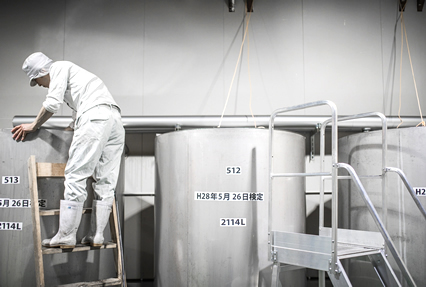 Our motto for making sake is "be thoroughly particular about the ingredients." We carefully select our sake-rice from the best of what is harvested in the Yamadanishiki sake-rice growing area in the Special A zone in Miki City. This Yamadanishiki is only polished up to 40% for the very special brew and 65% for the pure rice brew, then brewed. However, there is no intention to force knowledge of Japanese sake on those who drink it. I'd like them to pair it with cooking and enjoy drinking it. You also sell sherbet made with liqueur, isn't that right? upon all of humanity," is their motto. That's the "Adult Sherbet" series. Customers freeze Sherbets made from strawberry, rose, or yuzu liqueurs in their refrigerators for us. I especially recommend the sherbet made with strawberries from Shimizu in Akashi. There is also liqueur and white, cloudy sake made from those same strawberries. In the winter there is also a product called "yukinko." You put it in a snowman shaped earthenware pot and heat it up. I think I will always want to challenge new, interesting things within the framework of Japanese sake. You are sending the culture of Japanese sake widely around the world. made from unmilled rice has become popular overseas. Just as I thought, if you go overseas you can't help but feel your Japanese identity. My true hope is for them to think "because I'm Japanese, I'll drink Japanese sake!" Now, Japanese food is considered globally as healthy food. Along with that, I feel Japanese sake is also beginning to get attention. In this kind of favorable environment, I want to keep spreading "Akashi-tai" as the pride of Japan, made in Akashi. And I want to continue to make products which are particular about quality.